LA CENTER — On Tue., Feb. 13, La Center residents will vote on a proposed school bond measure for the La Center School District. The bond, which in total will cost $48,093,000 over a period of 21 years, will be used to build a new middle school for the district and to convert the district’s current middle and elementary schools, which share a single property, into an elementary school. If approved, the bond will cost residents of the La Center School District $0.77 for every $1,000 of assessed home value. Local educational taxes for 2018 are $3.87 per $1,000 of home value. In 2019, if the bond is passed, the local taxes will go up to $4.64. When taken into account with state educational tax changes, the bond, if passed, will increase $1.54 per $1,000 of home value by 2019 over 2017 tax rates. Thus, in 2019, the total educational tax rate, including the bond and state and local levies, will be $7.55, according to information on the school district’s website. If passed, the bond would be the first bond approved in the La Center School District since 2002. 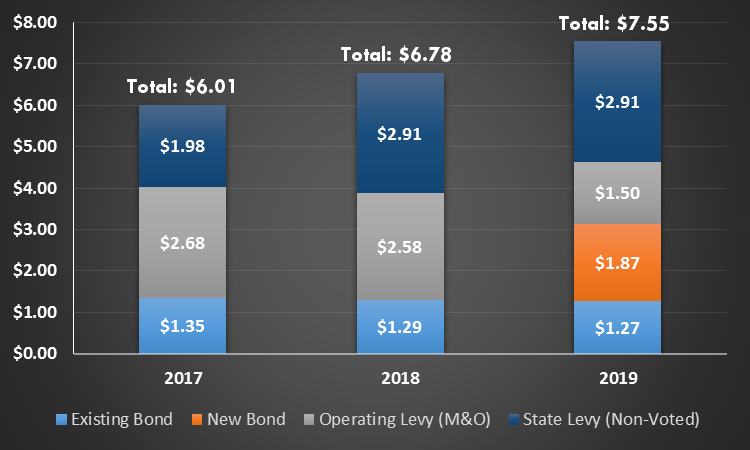 The costs of that previous bond are rolled into the current bond, and there is still approximately five years remaining on that bond. The 2002 bond was used to remodel La Center High School. The last attempt at passing a school bond by the district was in 2008. That bond, however, was not approved by voters. In the fall, members of the La Center school board were examining three options for what the bond should be allocated to build in the district. There were two options to build elementary schools of varying capacity, and a third to build a middle school. The bond measure as presented to voters will be to construct a new middle school. Courtesy of the La Center School District. According to district Superintendent Dave Holmes, the new school would be built on a 23-acre property behind the La Center post office, which the district has been in the process of purchasing. Holmes said that the main driver for the bond was the rapid growth in the city of La Center. The district currently has 1,755 students across three schools. In a demographic study conducted on behalf of the school district, the minimum growth projection for the district was 300 students over the next 3 to 5 years, Holmes said. The maximum projected growth was 800 students. 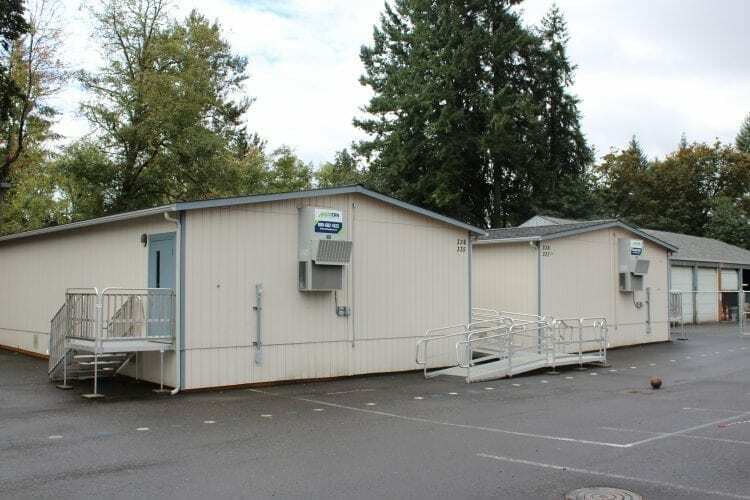 In the past, portable classrooms have been added to school property to increase capacities, and the district is ordering one new portable regardless of the bond outcome, bringing the current number of portables up to 12. Holmes said that adding more portables is not a viable solution to the growth in the district. He said that new portables would have to be built on either the softball practice field or the football and soccer practice field. “We literally have no other place to put them,” Holmes said. According to Holmes, most of the feedback about the bond he has received has been positive. He said that when people have concerns, they are mostly concerned that the district will build a school that is more “extravagant” than necessary. Holmes said that the planned school meets the needs of the district but is not wasteful. If the school can be constructed under the project estimate, Holmes said, then the extra money saved will not be spent or collected. The La Center School District recently concluded an agreement to transfer 60 properties in the La Center city limits near the I-5 junction from the Ridgefield School District to the La Center School District. As many of those properties are zoned commercial and industrial, the intent is that as those properties are developed, they will help contribute to the district funding. By adding those properties, Holmes said, the effective tax rate is spread across more properties, and thus the individual rate paid by La Center residents is reduced. Holmes also noted that the school district tries to be a good steward of its tax dollars. The current school levy makes up approximately 18 percent of the district’s total budget, but Holmes said that state law allows for 24 percent of the budget to be borne by levies. However, because La Center does not have many industries to support the levy, it is borne by primarily residential homeowners. With the bond vote approaching in February, the La Center citizens group Citizens for La Center Schools has been working to spread information about the bond. Melinda Mazna, chair of the group, said that the group has been attending various school events and sports games, as well as city council meetings and civic organization meetings, to provide answers about the bond if people have them. She also said that the group will soon begin a sign holding campaign, as well as going door to door and a telephone campaign to spread information in favor of the bond. Mazna said that it was important for the bond to pass because of the rapid growth of the La Center community. Adding a new school and remodeling the middle and elementary schools into a single elementary school would help provide students with the proper setting for learning, Mazna explained. “In the end, it’s like we just got to make sure we can provide for these kids to have the proper education,” Mazna said. In addition to the crowding issue and the problem of where to put more portables, Mazna said that adding more portables instead of a new school creates a safety issue for students as well. Students still need to travel from portables for lunch and other resources such as gyms, and Mazna said that creates a higher risk for an intruder coming onto campus and doing harm. In interacting with the public, Mazna said that the “majority has been very positive” towards a bond, as they realize the need for a new school. She said that there have been some individuals who have already decided to vote against the bond, but that there has not been a concerted effort to defeat the bond measure. If the bond does not pass, “we’ll have to go again,” Mazna said, and try different ways to explain the “true need” for a larger school. For the bond to pass, 40 percent of those who voted in the last general election must cast ballots. Of those voters, 60 percent plus one need to vote in favor of the bond to pass it. Mazna said that she was optimistic at the bond’s chances of passing. Holmes said that the patrons of the district take pride in the way that it has handled their money by doing what they could with what they have. More information about the bond can be found on the La Center School District’s website at http://www.lacenterschools.org/bond-2018-information/. More information about Citizens for La Center Schools is available online at https://citizensforlacenterschools.weebly.com/, or by contacting Melinda Mazna at mmazna@gmail.com.